To the astrobiologist, Enceladus offers a “gimmie,” 101 plumes of water, each 8,000 times the size of any geyser on Earth, emerging from a vast, warm subsurface salty, organics-laced ocean, in contact with a rocky core, on an alien object that requires no landing to collect. This makes especially pressing the question: What should we seek in this plume by way of molecules that might indicate whether that ocean contains life of some kind? In the near future, we may find out: NASA is developing detectors for alien genetic materials, using the definition of life developed by the NASA Exobiology Discipline Working Group in 1992, “a self-sustaining chemical system capable of Darwinian evolution." Here is NASA astronomer Bonnie Buratti's riveting diary on the 2009 Cassini Mission dive through the plumes of Saturn's moon Enceladus. Phew! We made it through the deepest swoop yet down into the plume of Enceladus, the encounter we call "E7" because it's the seventh targeted flyby of Enceladus. But now we have our work cut out for the next few weeks as we pore over the data, painstakingly analyzing every signal to understand the composition of the plume and its structure. After so many close flybys of Enceladus, we're starting to feel as if this little moon of Saturn is an old friend. But during the encounter planned for Nov. 2, 2009, we are going to get up-close and personal. Cassini is going to take its deepest dive yet into the plumes spewing out from the moon's south pole to try to learn more about their composition and density. The spacecraft is going to approach within about 100 kilometers (62 miles) of the surface. We've been closer before (25 kilometers or 15 miles), but we've never plunged quite so deeply into the heart of the plume. Watch the video of the amazing discovery below. This is the seventh targeted flyby of Enceladus, so we sometimes refer to it as "E7." At around 7:40 a.m. UTC (Coordinated Universal Time), we do our long-anticipated flyby through the plumes. The passage will be quick: traveling at about 8 kilometers per second (about 5 miles per second) – fast enough to go from Los Angeles to New York in less than 9 minutes – we'll spend only about a minute in the plume. Then, we zoom away from the plumes and Cassini turns on an infrared instrument (red rays in the animation) to take the temperature of the south-pole fissures known as "tiger stripes" where the plumes originate. A few minutes later, Cassini uses an ultraviolet instrument (purple rays in the animation) to measure the plumes against the background of the peach-colored Saturn. The infrared instrument then gets another turn to examine Enceladus. For more details, see the mission description. The focus of this flyby is to analyze the particles in the plume with instruments that can detect the size, mass, charge, speed and composition. Instead of using its eyes (the cameras), Cassini is going to use its senses of taste and smell. But we're going to get some pretty good pictures too, including some impressive shots of the plumes from far away. So far, we have detected water vapor, sodium and organic chemicals such as carbon dioxide in the plumes that spew out from the tiger stripes, but we need more detail. Are there just simple organic molecules, or something more complex? This is the first time we've found activity on a moon this small (the width of Arizona, 500 kilometers or 310 miles in diameter). We really want to understand what's driving the plumes, especially whether there is liquid water underneath the surface. 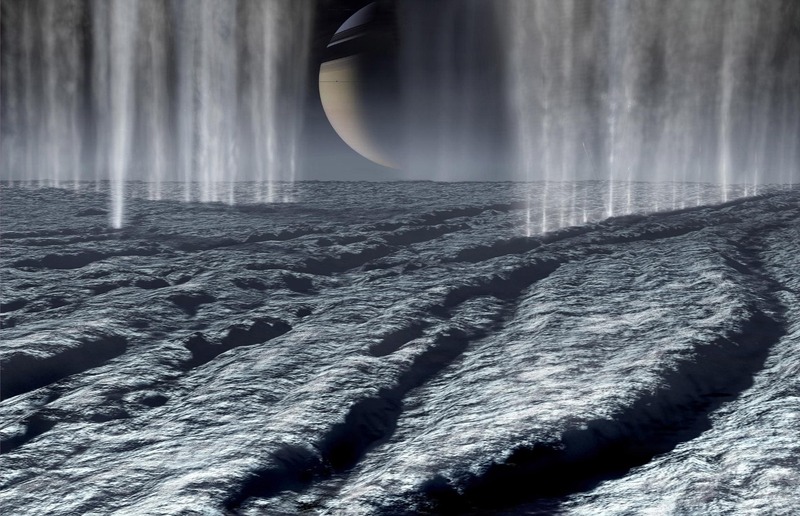 If we can put the pieces together – a liquid ocean under the surface, heat driving the geysers and the organic molecules that are the building blocks of life – Enceladus might turn out to have the conditions that led to the origin of life on an earlier version of Earth. So if this is all so interesting, why did we wait so long to travel into the plumes? One reason is the plunge is tricky. We wanted to make sure we could do it. We worried that plume particles might damage the spacecraft. We did extensive studies to determine that it was safe at these distances. We also wanted to have the right trajectory so we didn't use an excessive amount of rocket fuel. We are going very fast through this sparse plume; so to play it safe, we're using Cassini's thrusters to keep it stable through this flyby. We'll be monitoring the thrusters closely because we don't want to have to use them on another flyby through the plumes planned for April 28, 2010. In the future flyby, we plan on tracking the spacecraft very closely with the radio instruments on Cassini and on Earth so we can measure how the spacecraft wobbles as it passes near Enceladus. These measurements should tell us more about the interior of the moon, including whether it really does have a liquid subsurface ocean. With the thrusters on, we won't be able tell if the motion of the spacecraft comes from the gravity of Enceladus or the thrusters. We'd like to know whether we can rely on other kinds of attitude control equipment. We're all eager to pore over the results of this flyby. Stay tuned. In the meantime, feast your eyes on this map of the surface of Enceladus that the Cassini imaging team has updated and released today. The tiger stripes are located in the lower middle left and lower middle right of the image.